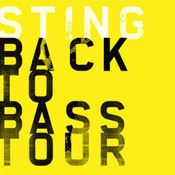 This autumn Sting takes the Back to Bass Tour throughout North America as he celebrates the 25th anniversary of his solo career by taking it back to bass… all the hits, stripped down, as they haven't been played in years. In support of his new box set collection Sting: 25 Years, which was released on September 27, the tour features Sting backed by a 5-piece band in an intimate theatre setting. Beginning in Boston on October 21 at The Wang Theatre at the Citi Performing Arts Center, the tour extends across the US and Canada visiting Philadelphia, New York, Washington DC, Toronto, Chicago, Detroit, Miami, Dallas, Houston, Denver, Phoenix, Los Angeles, Las Vegas, Reno, San Francisco, Seattle, and Vancouver. Login to watch the video at Virtual Ticket and stand by for further exclusive footage throughout the tour.